Dive into our tasty Savory Parmesan Spinach-Artichoke Dip! 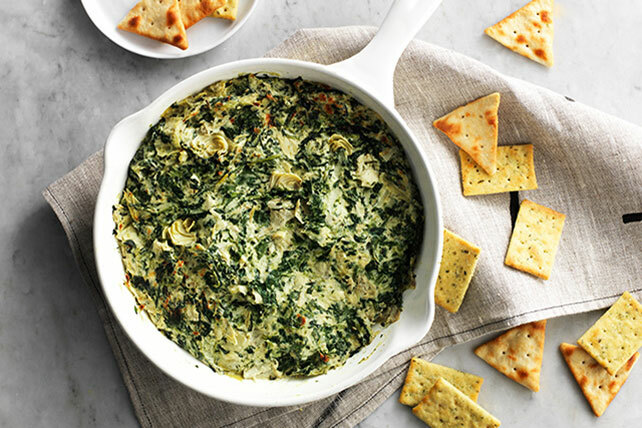 This Parmesan spinach-artichoke dip takes 10 minutes of prep, great for a gathering. Spoon into shallow baking dish sprayed with cooking spray. Place completely unwrapped package of cream cheese in medium microwaveable bowl. Microwave on HIGH 15 sec. or just until softened. Add remaining ingredients; mix well. Spoon into prepared shallow baking dish, then continue as directed. Serve with assorted cut-up fresh vegetables and/or crackers.